A great deal has been written about the Pilgrims, perhaps more than any other small group in American history. Yet they continue to be extravagantly praised for accomplishing what they never attempted or intended, and they are even more foolishly abused for possessing attitudes and attributes foreign to them. In the popular mind they are still generally confused, to their great disadvantage, with the Puritans who settled to the north of them around Boston Bay. The purpose of the Willison narrative is to allow the Pilgrims to tell their own story, insofar as possible, in their own words and deeds. Saints and Strangers brings back to life men and women who were among the most stalwart of American ancestors. 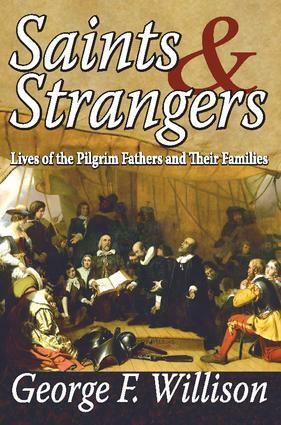 George F. Willison destroys the myth that too long has been created in the American mind: that Pilgrims, while pious and much to be admired, were a drab, stern people dedicated to prudery. Nothing could be further from the facts. These were lusty English people who were well aware of good food, drink, and pleasurable living. They were also an adventurous, hardheaded community united in their campaign for freedom of worship. The book takes the reader from the Puritan exile in Holland, their long and troubled voyage from old Europe to new America, and the hazardous period of settling on a strange, bleak coast. The Puritans were comprised of weavers, smiths, carpenters, printers, tailors, and working people--with scarcely a blue blood among them. It was a long trek to Plymouth Rock from English village life. Willison has produced a realistic picture of these people who often have been inaccurately portrayed with little appreciation of their substantial place in the history of a New World.